The black drongo (Dicrurus macrocercus) belongs to the family of drongos, the Dicruridae. 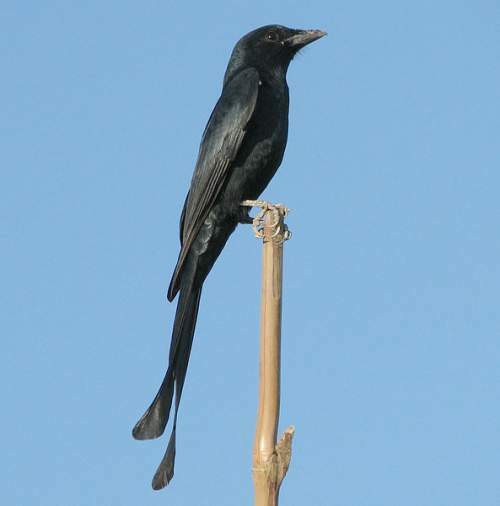 The black drongo species is distributed in Afghanistan, Indian subcontinent, southeast Asia, China and Taiwan. These drongo species are aggressive and fearless birds. These drongos are polytypic species. The black drongo (Dicrurus macrocercus) is a medium-sized drongo, measuring 28 to 31 cm in length. Both males and females look alike. The black drongo has overall blackish plumage. In adults, there is usually a small white spot at the base of the gape. The tail feathers are long and forked. The juveniles are brownish with white barring and streaking at the belly and vent region. The bill is short, slightly down curved and dark gray in color. The irises are dark brown. The feet are short and gray. The call of these drongo species is a loud, whistling "wee-tee-hee" sound. These black drongos are distributed in Afghanistan, Pakistan, India, Nepal, Bhutan, Bangladesh, Sri Lanka, Myanmar, Thailand, Cambodia, Laos, Vietnam, Malaysia, Singapore, Indonesia, China and Taiwan. In India, these species have been observed in all the states. Vagrants have been observed in Iran, Oman and UAE. The black drongo nominate subspecies D. m. macrocercus is distributed in southeast Pakistan and peninsular India (Gujarat, Madhya Pradesh, Jharkhand, West Bengal, Chhattisgarh, Odisha, Telangana, Maharashtra, Andhra Pradesh, Karnataka, Goa, Tamil Nadu and Kerala). The subspecies D. m. albirictus is distributed in east Afghanistan, north Pakistan, central and north India, Nepal, Bhutan, Bangladesh, northeast India, north Myanmar and southern China. The subspecies D. m. minor is distributed in Sri Lanka. The black drongo subspecies D. m. cathoecus is distributed in central, east and south China, Myanmar, north Thailand, and north Indochina. Wintering populations occur in south Thailand, south Indochina, Malaysia and Singapore. 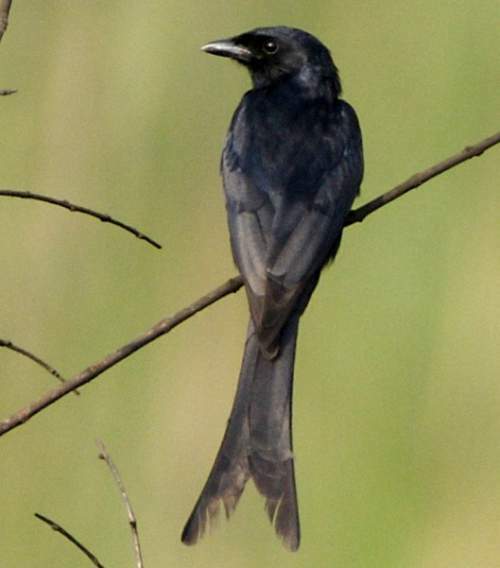 The black drongo subspecies D. m. thai is distributed in south Myanmar, Thailand and south Indochina. The subspecies D. m. harterti is distributed in Taiwan. The subspecies D. m. javanus is distributed in Indonesia (Java and Bali). These black drongo species do not normally occur in forests. They normally occur in altitudes from 0 to 1500 meters. The artificial ecosystems and habitats of these species include agricultural fields, heavily degraded forests and urban areas. The natural ecosystems and habitats of these black drongo species include tropical and subtropical dry grasslands, tropical and subtropical moist shrublands, dry savanna and dry shrublands. The diet of these black drongo species consists mainly of insects. Insects, caterpillars, grasshoppers, crickets, cicadas, locust, dragonflies, moths, beetles, termites, ants, wasps and bees are their primary food. They hawk flying insects. These drongo species follow cattle in pastures to catch the insects flushed out. They also follow the plough to pick exposed ground dwelling insects and insect larvae. They occasionally feed on small vertebrates. Though they are welcomed by farmers for feeding on agricultural pest insects, their habit of preying on honey-bees makes them a nuisance to bee-keepers. The breeding season of these black drongos is from March to June in Pakistan. The laying season is from March to August in India with a peak period from April to June. Sometimes a second brood is raised. Their courtship includes aerial and ground displays. These drongo species are monogamous and highly territorial. They defend the breeding territory aggressively and fearlessly. They confront large birds of prey by pecking and mobbing them. The nesting site is usually a fork of tree branch. The nest is a cup-like structure made with a thin layer of sticks and twigs. The clutch normally contains three or four off-white eggs with scattered black spots and blotches. Both of the black drongo parents incubate the eggs. The chicks hatch out after 14-15 days. The chicks are altricial, born in an undeveloped state requiring brooding and feeding by the parents. The young fledge after about 18 to 20 days of growth. These black drongo species are partially migratory birds. The migratory breeding populations (subspecies D. m. albirictus and D. m. cathoecus) occur in northern parts of their breeding range. These populations migrate southwards in September and October for wintering. The other black drongo subspecies are non-migratory resident birds. They disperse locally after breeding. The populations in higher altitudes descent to lower levels during winter. The global population size of the black drongo (Dicrurus macrocercus) has not been quantified. The overall population trend of the species is not known. In most of its range, this black drongo species is reported to be locally common. The generation length is not known. Its distribution size is about 26,100,000 sq.km. Habitat alteration and destruction, loss of insect populations due pesticide use, hunting for food and trapping for pet-trade are the main threats that are endangering the survival of these species. The black drongo (Dicrurus macrocercus) does not approach the thresholds for being Vulnerable, either under the range size criterion, or under the population trend criterion or under the population size criterion. The CITES (Convention on International Trade in Endangered Species of Wild Fauna and Flora) status is ‘Not Evaluated’ for the black drongo (Dicrurus macrocercus). The black drongo (Dicrurus macrocercus) is closely related to the fork-tailed drongo or African drongo (Dicrurus adsimilis). The black drongo was earlier considered conspecific with the fork-tailed drongo. The seven recognized subspecies of the black drongo are: D. m. macrocercus Vieillot, 1817, D. m. albirictus (Hodgson, 1836), D. m. javanus Kloss, 1921, D. m. harterti E. C. S. Baker, 1918, D. m. thai Kloss, 1921, D. m. cathoecus Swinhoe, 1871 and D. m. cathoecus Swinhoe, 1871. Current topic in Birds of India: Black drongo - Dicrurus macrocercus.